Meet the newest content creator for People of Pacific, Raisa Haque! We wanted to take a moment to showcase her and the items that represent her personality. 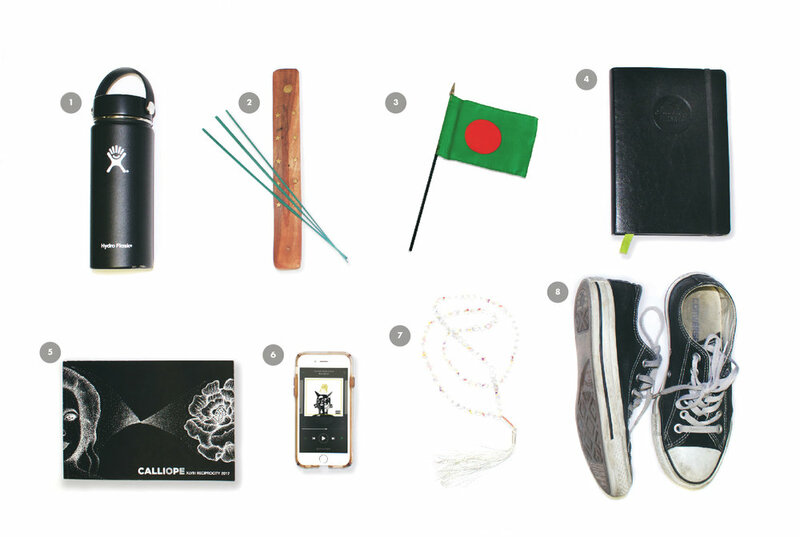 It is always tough to define a person in only eight items, but Raisa was up to the challenge and she chose a few things that highlighted her passions and interests. I know we need all it to survive but you’ll always find me drinking water. I just bought a hydro flask and I’m really loving how you can have cold water and then hot tea and it stays that temperature throughout the day. When I’m at home I usually always light a candle or incense especially when I’m cleaning or doing homework. It sets the mood and the scents make you feel like you’re by the ocean relaxing. It doesn’t necessarily have to be a romantic thing either, it just makes your room smell really good. I was born in Dhaka, Bangladesh and came to America when I was two. My family and I always go back two years at a time and every time I’m back I love the food and wearing traditional clothes. It keeps me close to my roots and practicing Bengali more often. I started planning and making to-do lists at a very young age. When I got to college, I discovered Passion Planner. I recommend Passion Planner for every college student because it really helps you manage your time, follow your passions, challenge yourself, and stay positive. I think it’s an awesome company and it helped me put all my thoughts and ideas in one place. There’s an ‘infinite possibility’ section where you can doodle or write anything. I love the quotes that come with every page as well! It’s one of my favorite pieces because the quotes are very motivational and they inspire me on the daily to do better. See how others use their passion planner! My poetry professor last semester convinced me to submit my work to Calliope and I was very excited to find out two poems were chosen in a rigorous pool of folks. Poetry is one of my greatest escapes and outlets which helps me express myself creatively and recognize the beauty of vulnerability. The premium student plan is such a blessing. Music is such a huge part of my life. I really started getting into rap my senior year of high school. I fell in love with iconic artists such as Tupac, Biggie, J.Cole, Kendrick, Lauryn Hill, and more. I grew up mainly with a lot of R&B music and hip-hop through my sister's influence but high school is when I explored Indie rock, indie pop, and reggae. I love making playlists on Spotify and if you’re into chill music you should follow my “chill fam” playlist or my ‘throwback party’ playlist. My username is rubaabskii. You can check out of my playlists and follow one for any mood! These beads symbolize the remembrance of Allah and saying His name in praise thirty-three times after my regular prayer. My mom passed down her old one to me and I want to preserve mine and eventually pass it on too. My black and white converse shoes are my go-to for going out. If it’s a hot day I’ll usually wear sandals or sliders but these pair of shoes have been overseas, out of state, in mud, grass, and traveled many miles on foot to the point where I’d get blisters on my feet.